Kentucky – Let's Go RVing! We woke up to pouring rain. What a wonderful day to stay inside and do nothing after we went to church. 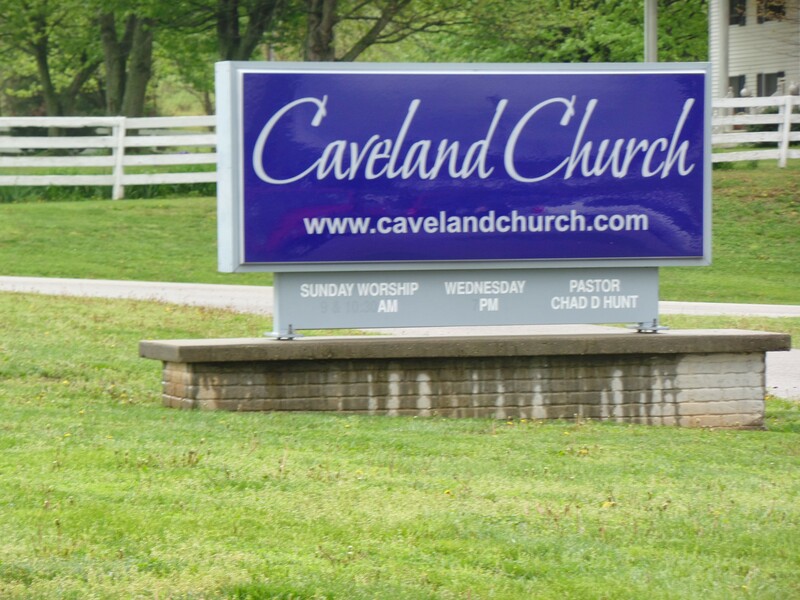 We had seen a church not far from the campground called Caveland Church. I initially thought it was Baptist but now feel that it was probably independent. When we left Jerry asked me what I thought and my response was “I heard a sermon!” The music was praise and worship and when I didn’t know the songs they were easy to follow. The minister preached on Elijah and his ridding Israel of the Baal priests. Interesting that we heard a sermon today on Elijah after seeing the Days of Elijah on Monday. After church we came back to the RV and had lunch. We read for a while and then decided to go for a ride. We ended up in Bowling Green where we went to Camping World, Gander Mountain and Kroger’s. Our Garmin is not working correctly as the keys on the right will not work and we need a GPS for the car during all of this touring. We bought a Magellan and hopefully will be satisfied with it. If not it’ll go back to Camping World and I’ll get another Garmin from Amazon. While we were in Gander Mountain the bottom fell out so we wandered around there for a while. After riding around Bowling Green for just a few minutes Jerry spotted a Krogers so we stopped in there. We had thought of stopping at Sam’s also but it was raining pretty hard so we came on back to the motor home. After we got in we read for a while, had dinner, cleaned the dishes and were just getting ready to go for a walk when it started raining again. Probably just as well as my legs (thighs) are so very sore it’s difficult to get up and moving. I can’t imagine why they are so sore but man, they are. Going to get ready for bed now and hopefully stay awake to watch the 3rd installment of A.D. Don’t know if I’ll make it or not as I am still on EST! We got up a little before 7:00 thinking we needed to be on our way to Mammoth Cave by 9:00 so that gave us an hour for coffee and an hour to get ready. Boy are we settling into a routine! We left a bit after 9:00, stopped at the entrance to the park and took pictures in front of the sign. Unfortunately no one else was there so no pictures of us together. In fact I don’t think we have a single picture of the two of us on this trip. 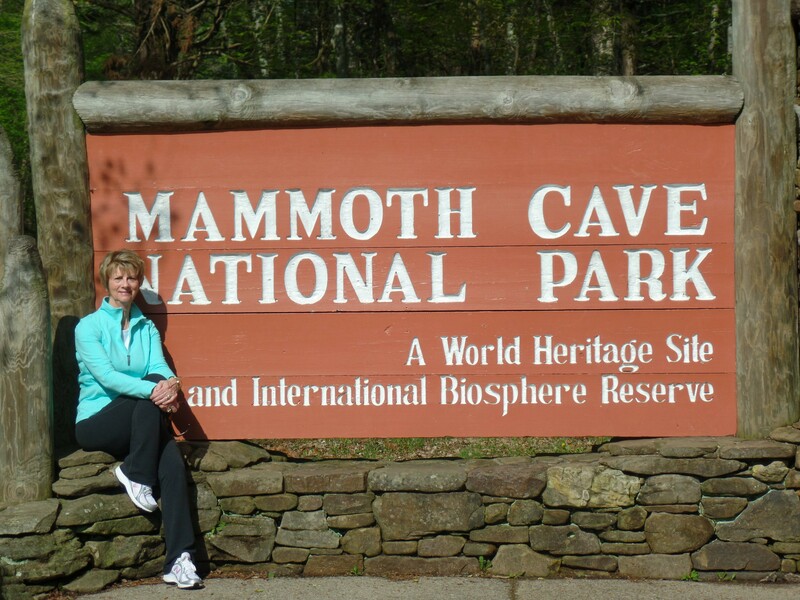 We got to the Visitors Center for Mammoth Cave and walked around the souvenir shop. I saw a cook book that looked interesting and Jerry saw a book on whittling that he liked but we didn’t want to buy anything that we’d have to carry. We had both left our phones in the car so all we had with us was a bottle of water and my shoulder purse with the little camera and cough drops plus we each had a jacket. The temperature in the cave is supposed to be around 60 so they suggested jackets. The tour we chose was called the Domes and Dripstones Tour. It includes a dramatic series of domes and pits, typical large trunk passageways, and a short journey through numerous dripstone formations. We met at Shelter B a little before 10 and the guide, John gave us a brief description of the tour. He said if one was afraid of close places or heights that we probably shouldn’t go on the tour – well – that was me but I wanted to try it. Along with many other people we got on two buses that took us to the cave entrance. John again emphasized that it could be claustrophobic. I thought I already knew that! He talked about leaving no footprint behind. We were not to touch anything as the slightest touch could leave ramifications for years to come. We walked to the entrance and began the descent. I immediately began to feel claustrophobic. There were people in front of me and people behind me so there was nowhere to go but ahead. I’m sorry to say but there were several people speaking in a language that I was unfamiliar with and my first thought was of terrorism. The guide often used the word “government” in his conversation and I was a bit uneasy. I whispered a prayer and then decided that my days were already numbered so if I was going to go like this then Lord had already planned it but how sad that our country has reached the place where I should be worried about something happening like that. Thank goodness that I didn’t realize that it was the 20th anniversary of the Oklahoma City bombing. John also emphasized that the activity level was moderate and there were 500 steps including 280 on the descent. Perhaps you can get an idea of what it’s like. It was difficult to see around us and the path was narrow so I had to watch where I was walking so as not to stumble. A lot of the time there were rails to hold onto but I was reluctant to use them. I eventually did and discovered that for the most part they were wet from the dripping ceiling so hopefully that washed the germs away. The cave was fascinating. 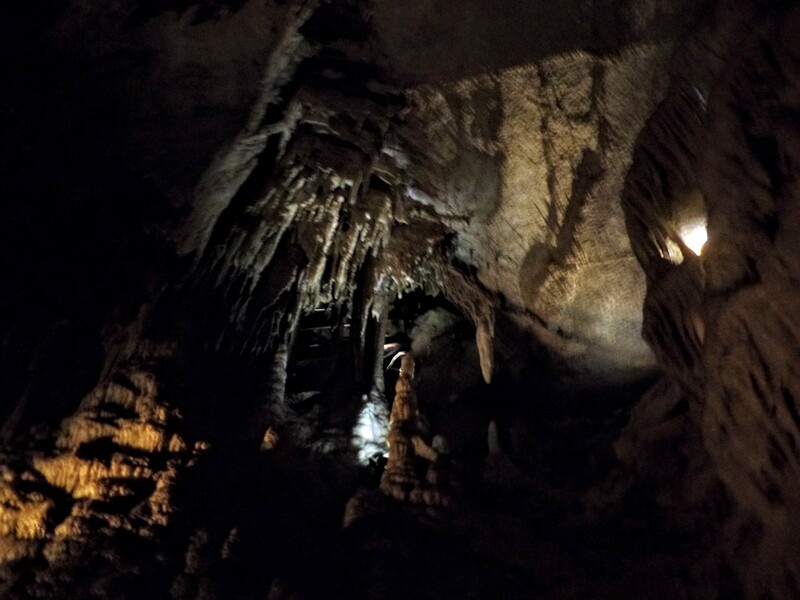 It is the longest cave in the country and the stone is limestone. As we neared the end we saw the stalagmites and the stalactites and they were very impressive. It is a tremendous cave, an awesome experience. I’m glad I went but not sure I’d want to do it again with that many people. It is a very popular attraction though so I guess there are always a lot of people on each tour. When we left we had to walk through a bio-hazard area to make sure we were not transferring White Nose bat syndrome harmful only to bats and already killing millions of them. As they eat a lot of mosquitoes that really makes a difference in the ecological system. Walking through the bio-hazard area was like walking on soap suds though not slippery. After the tour we wandered around the gift shops and I saw a pretty rocking horse that we may go back and buy later. We discussed whether or not we wanted to go on any more tours and the one Jerry was interested in was the Lantern tour where you had to carry a lantern because it is so dark. Unfortunately it was sold out and is only offered Fridays and Saturdays. It was past lunch time so we headed back to the RV for lunch. We then sat outside for a while as the weather was just perfect. In fact I put on a pair of shorts. After a while we both came in and took long naps. Neither of us slept well Friday night. I’m not sure if it was the time change, knowing we had to get up and out in the morning or the train that came through a couple of times that caused it but in spite of the beautiful day we stayed inside and slept! Afterward we sat outside and read for a while longer. Nothing exciting about the afternoon but I guess we needed a slow day. Unfortunately the weather is expected to deteriorate and begin raining during the night so I guess we missed some good touring time. After dinner we took a walk and ended up visiting with some full-timers who are heading back home to Indiana where they will be camp hosting for the summer. We were joined by another couple from Louisville who are visiting family and we just sat around and chatted. Both couples have been RVing a while and have traveled extensively. I just listened! The full-timers, Sheryl and Ted asked us to join them Monday night at Anna’s Greek Restaurant. I told Sheryl I’d check with Jerry and let her know. It was a very pleasant evening and what I really like about traveling this way. We didn’t get back to the RV until almost 10 and by then it had cooled off considerably. No plans at this point for tomorrow other than hopefully going to church. Other adventures depend on the weather. We woke up just before 7:00 and got on up and started getting ready to pull out. I just had to have my cup of coffee though before I could start getting dressed. Jerry showered, then I did and then we secured everything. We pulled out of the camp site a little after 8:00 stopping to put out the trash and pulled out of the campground at 8:19. Another record for us! Unfortunately we got caught in some one lane traffic congestion leaving Sevierville and it took us nearly 45 minutes to really get moving. The drive for the most part was easy, four lanes but a little mountainous. We stopped at a Pilot station just before we reached the Kentucky state line and filled up. That was good because gas in Kentucky is significantly more expensive. About 11:30 Eastern Time Jerry said he needed to stop and go to the bathroom. Since we were pulling up to a stoplight I offered to just switch places and drive while he went to the back to use the facilities. Little did I know that I’d be driving for almost 2 hours! Soon after I started driving we ran into more construction. The right lane was closed so I was driving in the left lane in a construction zone constantly afraid I could run off either side – that was scary to say the least. I went pretty slow, about 45 hugging the middle of the lane, and I’m sure the people behind me were fussing me out. Sorry but I did what I had to do to stay safe. Apparently Jerry wasn’t worried at all as he went to sleep! 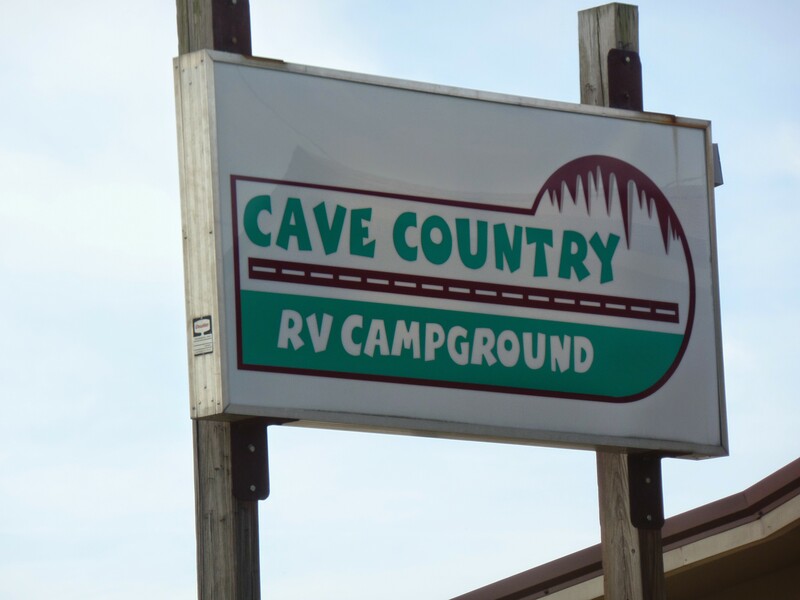 I really wanted to drive all the way to the campground but as we were entering Cave City about 15 minutes from the campground I could look ahead and tell that there was a lot of traffic and things were pretty close in that little main street. We got another red light and fortunately for me we switched drivers again. Got to the campground, Cave Country Campground a little after 2:00 Eastern Time. We got settled and sat outside for a while plus briefly visited with our “neighbors” who are on their way to Indiana to buy material for quilts. They had recently bought their new coach, a Newmar Ventana. Jerry then suggested we go for a ride so we rode to Mammoth Cave National Park to get a feel for everything. We ended up going into the Visitor’s Center and after studying a brochure we bought tickets for a 10:00 tour on Saturday called Domes and Dripstones. It’s two miles and the difficulty is moderate. Hope we can make it! Of course after leaving we had to go do some more grocery shopping. Seems that whatever we get we always need something else. We went to a Walmart – guess we’re trying to see how many different Walmarts we can shop in. We discovered a church on the way that we may try to attend Sunday. Grilling steaks and then since my body thinks it’s an hour later we’ll probably turn in early. Although we had talked about tailgating at the game today Jerry and I decided due to our late arrival home last night we’d just have lunch at the RV and leave about 12 to go to the game. I sent Sandy a text this morning letting her know what time we’d pick them up. I think we both slept well last night since we were exhausted from the previous day. I was a little tired this morning though. We decided that we had to do some laundry so I gathered all of the clothes and towels and Jerry went to the laundry facilities. I stayed behind and straightened up and cleaned fingerprints! When I told Jerry I had cleaned the fingerprints off of the mirrors he wanted to know why I hadn’t taken a picture of them like I had with Eva’s. When he got back we began to get dressed and have a quick lunch. Sandy and Landy knocked on the door about 11:35. She hadn’t gotten my text and they’d been out walking. They hustled and got ready and we took off for downtown Louisville. We had to go by and pick up our ornaments that we made on Thursday. We then headed on to the parking lot designated for the State fans. Interestingly enough the University is not far from Churchill Downs and it’s all downtown in the middle of the city. We got to the parking lot around 1:00 and after parking Jerry immediately took off walking around. When he got back he said he had been talking to Bo Hines’ dad. The folks next to us had a son playing, #89 a tight end – like I know what that means! After visiting with some of the State fans we took the chairs out and snacked on chips and salsa. Sandy and I decided that we needed a cup of coffee so after asking if there was a Starbucks nearby and feeling really foolish when they guy pointed to it behind us we walked over there. Chatted with a young girl who had on a Saddlebred sweatshirt and was preparing for Nationals. Got the coffee and walked on back. As we were getting ready to walk over to the stadium Jerry noticed the couple walking with us had Advocare jackets on so we started chatting with them. The lady and I discussed what we were eating and she suggested chicken and said they also ate a lot of bison – don’t think we have much of that in NC! Thank goodness I had my cuddleduds on although I could have worn the fleeced lined pair. It was cold! 57 degrees but windy with no sun. Our seats were toward the end zone but we could see the field clearly. We lost – again – but at least we weren’t embarrassed. We left with less than 2 minutes to go and apparently the State team did also because as we were walking out Louisville scored again. Oh well. Our GPS apparently doesn’t know where Shepherdsville is as it again took us on some strange way way out of the way. Jerry got frustrated after about 45 minutes of driving and ending right back up near the Papa John’s stadium. We finally saw a sign indicating Hwy. 65 and decided to go that way and ignore the GPS and the phone GPS. Our campground is off of 65. Finally we got back after 8:00. We were having warmed up meat loaf and I had cooked cabbage this morning so all I had to do was peel and cook the potatoes. As I was cooking them I realized that I had neither a mixer or a masher but did have a chopper. Jerry got the chopper and chopped the potatoes into mashed potatoes and they were just as good. Just as we were finishing with the dishes I got a text from Helen Jo asking me to call when I had time. We talked over an hour about Mom and what decisions need to be made. Still no answers but I feel bad about figuratively abandoning Helen Jo to deal with everything. Guess this is our last trip for a while. Went on to bed but it was almost 10:30 and I knew I would have trouble going to sleep – yep -it was 3:00 in the morning. Didn’t know the Closer came on that many times. I had to leave the TV on. Otherwise my mind was working overtime worrying about Mom and Helen Jo and trying with no success to come up with a solution. Just praying for answers! 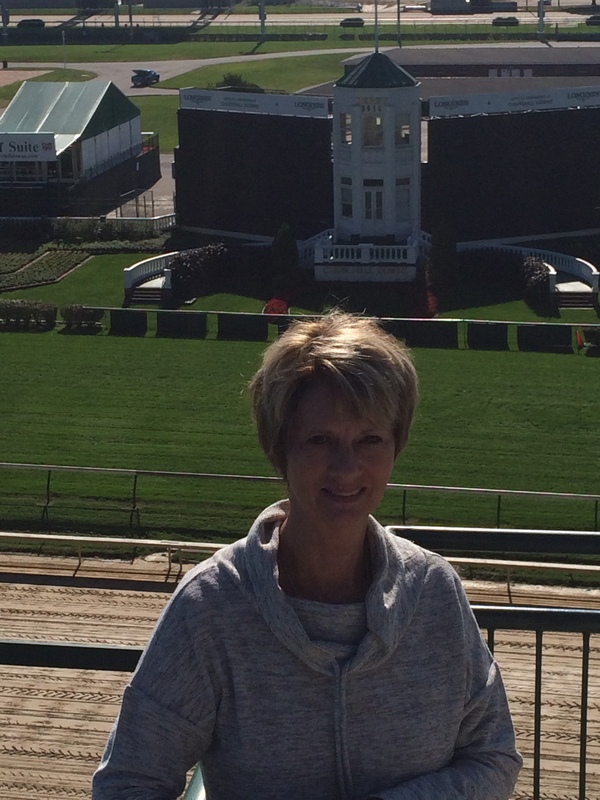 The day started very early as we got up at 5:30 to head to Churchill Downs. Landy called and said that Sandy wasn’t feeling well and they wouldn’t be going so Jerry and I took off arriving about 7:00. Our first tour was of the barn and the backside and we got to ride through the stables and then watch the horses work out. We stood in a little raised box to watch the horses. Got to see D. Wayne Lucas riding around in his western saddle and cowboy hat. The horses on the outside of the track are waiting their turn, the horses in the middle are galloping or breezing and the horses on the inside of the track are out and out racing. It is surely organized chaos, certainly nothing like the saddle horses working out in the ring after the show. They horses work from 6:00 to 8:00 and then the track closes for a while and reopens for another couple of hours. They have “dorms” for some of the people working there. Interestingly enough stalls are rented at $7.50 a day and some trainers elect to leave their horses there. They only have about 800 horses on site now but the fall season starts at the end of the month so more will be coming in soon. We returned to the museum and went through that. We watched a panoramic 360 degree movie that was spectacular. My little stool was quite clean by the time the movie was over as I had spun around a number of times. The museum was very interesting. I made a pretend bet – lost of course, took some pics and wandered around for a bit. 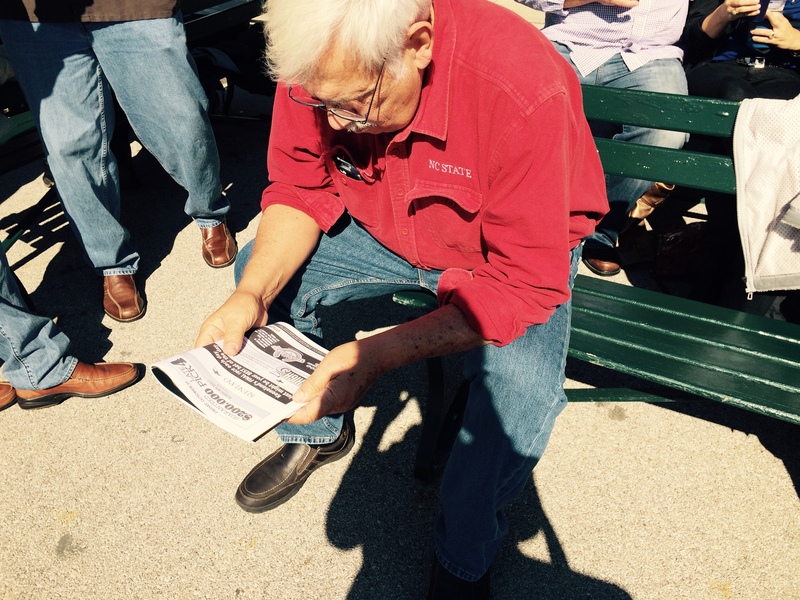 Then we went to tour the grandstand. The twin spires are so impressive as are the various rooms. We were able to go into Millionaire’s Room where Queen Elizabeth watched the races one year. To say it was nice and plush is quite an understatement! 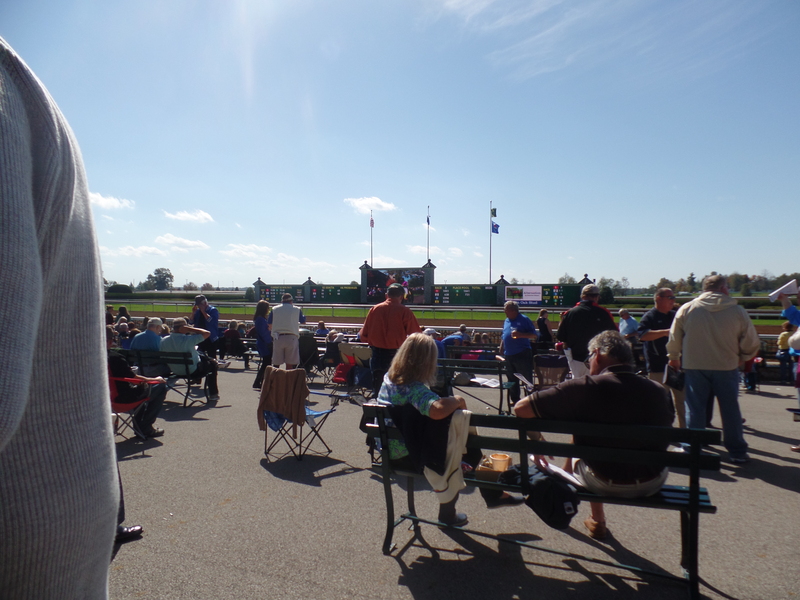 We also went into another room which for $35 you can attend the race, sit at tables, go out on the balcony for the races and eat at the buffet all day – except during the Derby week-end and the Breeder’s Cup. We had the rest of the day to ourselves so since neither of us had ever been to a horse race back to Lexington we headed for the races at Keeneland. What an exciting afternoon and new experience for us. We found a parking space in a huge lot, so big I wondered if we’d ever find our car once we left it! We went into the general admission area along with many other people some dressed to the nines and some quite casually. We had heard that it was college day and apparently the college kids were the ones that were so dressed up. Sure would have hated to be walking around in those high, high heels! Since we knew nothing about what we were doing we decided we’d spend $20 betting. Jerry placed most of the bets but I finally placed one. How did we make choices? No idea except we had heard that we had heard that Rosie Napravnik had won some the previous day so we bet on her when she rode. I think she announced her retirement the next day! The day seemed to be a lot of hurry and wait. It only takes a few minutes for the race to run and then there’s the set up for the next race and that definitely takes longer! It was so much fun and quite an experience for a horse show girl. On the way back to the car Jerry leaned down and picked up a time off of the ground – the extent of our winnings that day! The trip back was – um, interesting. The Rand MacNalley GPS does NOT know the way from Lexington, KY to Louisville, Ky. We got so lost and lost cell coverage as well. Stuck in traffic Jerry suddenly looked up and asked if the exit ahead was the one we were supposed to take. Yep, it was but the GPS didn’t know it. We made it back to the campground and then it was so dark we couldn’t find our RV! The campground roads wind and we kept going by Sandy and Landy’s but couldn’t locate ours. I was beginning to think someone had stolen it! What an evening!